Ever since WotC decided to release Standard sets online earlier than before, players have relied on MTGO results to prepare for their paper events. So it’s not hard to see how MTGO prices can affect paper prices. But how true is the reverse: do paper events affect prices on Magic Online? Last weekend, a new deck emerged in Modern and took down an SCG Classic by surprise. The idea of Skred Dragons probably came from the Mono-Red Dragons deck in Standard. Sarkhan, Fireblood is the main fuel of the deck, which plays 10 copies of Dragons in the entire 75. Running so many creatures that cost more than four is unusual in Modern, unless they’re paired with ways to ramp or create extra mana. There used to be a “Dragon Stompy” deck in Legacy as well, but I don’t think it is still strong right now. Anyways, the win with Skred Dragons last weekend caused the price increase on Thunderbreak Regent. The spike isn’t huge, but it’s still relevant for anyone who somehow kept a bunch of Thunderbreaks in their binders. Next up, I’m going to show some examples of paper events affecting prices on MTGO. These are among the most impressive spikes ever to happen in Magic history. New players in Modern might not know about GriShoalBrand, as the deck isn’t that popular nowadays. But older players definitely know this deck that made its first appearance in June 2015. The introduction of Nourishing Shoal and Worldspine Wurm to the Goryo’s Vengeance deck gave the deck more life to activate Griselbrand’s ability, thus making the deck more consistent in achieving an instant win once Griselbrand is put into play. Nourishing Shoal spiked when it was seen on camera at GP Charlotte 2015, where the deck eventually reached Top 8. This was one of the cards that impacted the Modern metagame very hard in Modern history. GrisShoalBrand didn’t win the GP, but in every event after that, Goryo’s Vengeance players were packing a playset each of Nourishing Shoal and Worldspine Wurm. When Shoal spiked, the other half of the combo also increased in price drastically. Noticed the obvious increase between June and July 2015. That is the exact moment when the public learns that Shoal and Wurm make the deck way more consistent than before. Presumably the combo was some local player’s secret tech for a while, but it hadn’t been used in premier events before. Pro Tour Oath of the Gatewatch was another premier event that had a major impact on MTGO prices. This was the season right after the banning of Summer Bloom and Splinter Twin, when Eldrazi totally dominated the metagame and only one or two other decks were even viable. Eye of Ugin was the highlight of the PT weekend, powering out the new Eldrazi creatures in Oath of the Gatewatch (OGW) like Reality Smasher, Thought-Knot Seer, and Eldrazi Mimic. Not only did the legendary land allow the player to play every Eldrazi Mimic in hand on turn one, it also made casting a turn-two Thought-Knot or Smasher way more consistent with the help of Eldrazi Temple and Simian Spirit Guide. As you can see in the graph, the spike actually happened before OGW was released on MTGO. That was due to discussion happening online when OGW spoilers were going on. Back then, cards were released online a few days before the Pro Tour, so there was very little time for players to test on MTGO before buying into copies of Eye of Ugin. It happened that the theories about the strength of the card were proven true at the Pro Tour (this was highly predictable), which is why the price of the card spiked further during the Pro Tour weekend. Eye of Ugin wasn’t the only card to spike in response to the new Eldrazi deck. Many players wanted to play the deck online, causing a sudden increase in demand for all components of the Colorless and UR Eldrazi decks. Chalice of the Void was a particularly important part of the strategy. With Simian Spirit Guide players could cast Chalice for one on turn one, shutting off many decks like Infect, Zoo, Burn, and Jund. Online players didn’t take this deck seriously until it became the champion at GP Vancouver. This time, however, the market response wasn’t a spike in the deck’s components, but rather a slow growth as Jund Death’s Shadow gradually became the most played deck on MTGO. Surgical Extraction suits the theme of the Death’s Shadow deck—mana efficiency and self-imposed life loss. For just two life, players could exile a playset of any card in the opponent’s graveyard. This card is very powerful because Jund Death’s Shadow has a bunch of discard spells, and even Fulminator Mage to destroy lands like Valakut, the Molten Pinnacle or Urza Tron lands. The recurrence of Fulminator Mage with Kolaghan’s Command and Liliana, the Last Hope made this black-red creature a core sideboard card of Jund Death’s Shadow. Previously, only the regular BGx and Jund variants played this card in their 75—the sudden increase in demand caused the card to increase to 35 tickets. The namesake card itself was surprisingly unpredictable, even though the deck was built around it. This could be caused by the Modern Masters reprint which happened around that time. Is speculations possible on this category of spikes? I think it’s doable, but not without a lot of work. Basically, what’s required is a lot of insider and/or live news from premier events happening around the world every week. For example, if you happened to be there at GP Charlotte 2015 and had already witnessed the power of the Nourishing Shoal-Worldspine Wurm combo, you might be able to deduce speculation of these two cards was a good call. Without information like this, investing in cards blindly is not likely to get you the right ones. 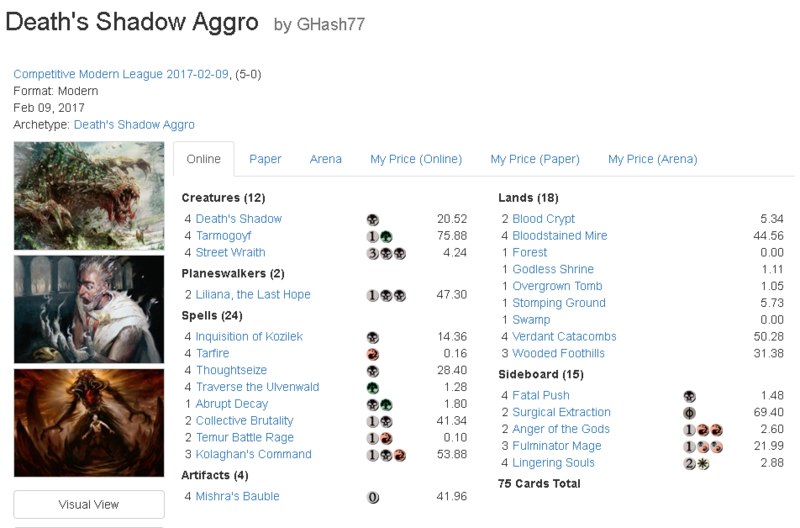 The Jund Death’s Shadow example is easier to profit from since the price increases happened slower. In this case, you would have had plenty of time to make the right decision and pick up the cards, even if you missed the first weekend.